On Tuesday 10th March Year 1 walked to Harrison Primary School to meet Nick Sharratt, a well known children's author and illustrator. We were there with some other local schools. We all brought paper and pencils with us and Nick showed us stage by stage how to draw some of his characters. He also shared several of his books; Mrs Pirate and Caveman to name but a few! Following this, we all had the opportunity to buy one of his books and get it personally signed. 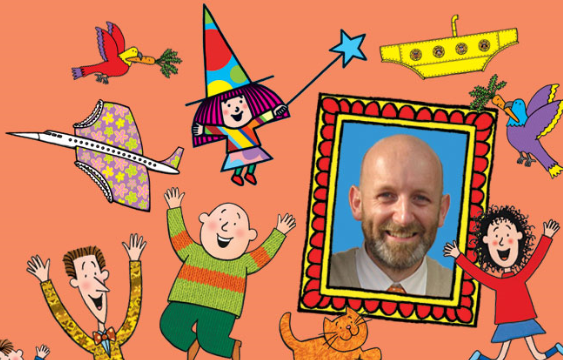 We all had a fantastic experience working with Nick Sharratt and we talked about it during a long walk back to school. We are very excited to tell you that popular children's author, Jeremy Strong will be visiting the school on Wednesday 26th November. Over the course of the day Jeremy will hold an Author Talk with the children where he will share pictures, explore how he works, where he gets his ideas and how he plans a new book. At the end of the school day Jeremy will stay to sign books and meet the parents. A selection of Jeremy Strong books will be on sale on the day. In order for us to prepare for Jeremy's visit we would like to encourage the children to read a range of his books: why not join Streaker, the 100 mile and hour dog as she causes no end of trouble, see how loopy Nicholas's family really are, in the 'My Brother's Famous Bottom' series or find out if there really are such things as cosmic pyjamas! There is something to entertain everyone, from the smallest child to even the biggest kids!